Chapter 1 – Sun, Wind, Cloud and Rain! 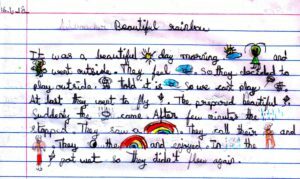 I feel elated to share my classroom experience on the Chapter, Sun, Wind, Cloud and Rain, in Grade IV. “I like winter because, I like cloudy and snowy weather”, etc.. I listed on the board the vocabulary elicited through this activity. I introduced more weather-related vocabulary using flash cards, like, blizzard, hurricane, typhoon, tornado, tsunami and earthquake. We also used a weather clock made by one of our students. Here is a teaching aid that I prepared for the class. In the next class I started with the Mini and Apu story from the Textbook. Children were eager to listen to the story, which we followed with an activity of ‘Writing a haiku’. 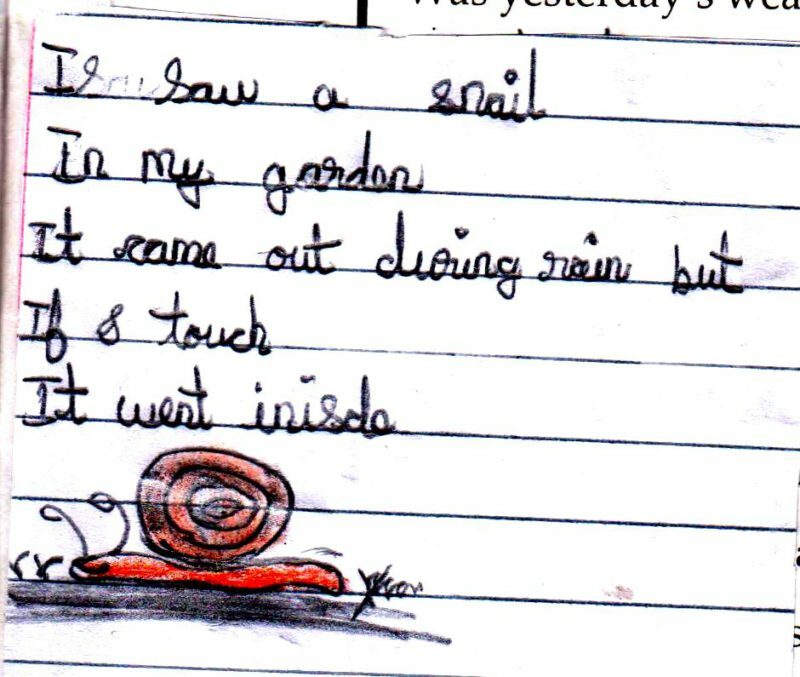 Only a few children were able to write a few lines of haiku. Below is one nice attempt by one student. 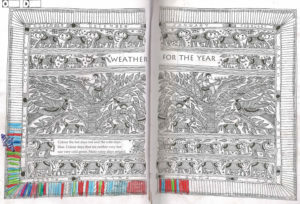 On the next day we started the activity, ‘Weather Watching’. We went to our school ground. All the children were eager to describe the weather. It was a sunny and calm day. The questions in the Textbook helped students to frame their descriptions. 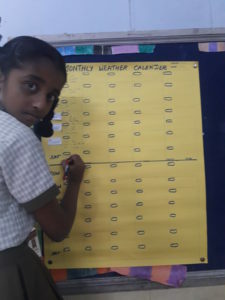 Some children were confused between climate and weather, so I explained the difference between the terms. 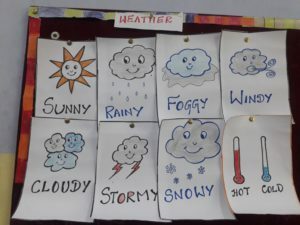 This activity improved the students’ observation as well as description of the weather. 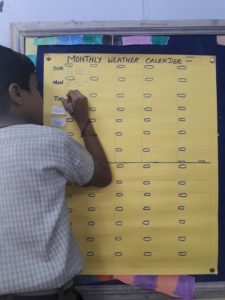 On Day 3 we started with the story-making activity from the Textbook p.4, in which children need to add descriptions related to the weather. Here the description of weather were more detailed. In creating up the story of Mini and Apu’s play with the kite, children used pictures and describing words. 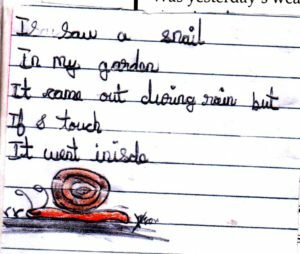 Although this is recommended as an oral activity the students did it using drawing and writing. All the students contributed enthusiastically to the story and gave a title for it on page 3 in the Workbook. Here are some sample responses. On Day 4 we designed a chart using the calendar format given in the Small Science Workbook and displayed it in the classroom. Writing dates and days on the calendar was done in the class. 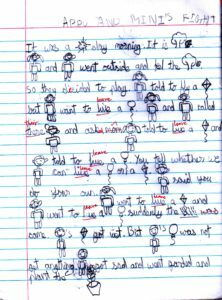 I did one example in the class chart and asked the children to write it in their workbook, pp.4-5. I told children to observe and write on the chart in the order of their roll call which they know very well. 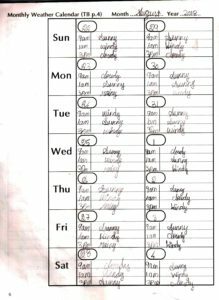 In previous years I had found that students forget to write observations regularly in the workbooks but, with the new system, almost all students completed their observation and writing in the chart as well as later in their workbooks. 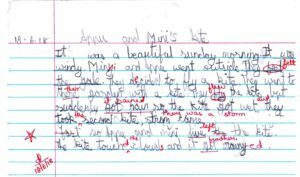 This activity was especially useful as otherwise the children who tended to forget used to copy from their fellow students, but now they were all more responsible and would remind each other of their turn to write.